BUYING HIGH AND SELLING LOW? Home » Blog » BUYING HIGH AND SELLING LOW? 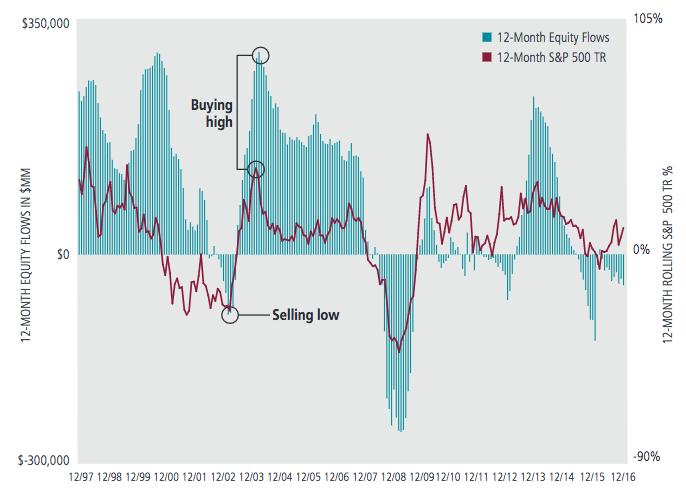 We have all heard the old investing mantra ‘Buy Low and Sell High’ but history shows investors do the opposite. Why is that? Emotion. As humans when adverse market situations arise, like the correction last week, investors tend to get emotional about their investments and want to run for the hills. Over the last decade and a half, the months with the ten largest US equity fund inflows have often clustered around short-term peaks in the S&P 500 Index. These likely represent periods of euphoria, when investor confidence is high. Movements in and out of the market are counterproductive for investors because they end up buying when prices are high and selling when prices are low. For example note the chart showing monthly flows for U.S. stock mutual funds vs. stock market performance from Dec 1996 – Dec 2016. Continually investors have piled into markets during euphoric stages and left in droves during hard times. Hard times are where the best opportunities lie. Realize as a long term investor a 10% correction is basically an annual event happening on average every 357 days. Secondly, it’s worth noting that if you have 20 years to invest there are zero 20-year periods where the stock market is down from the month and year you started. Don’t get emotional and stay away from the headlines. It’s important to understand that corrections can be seen as buying opportunities and markets reward long term participation.